1. Difficulty building networks/collaborations: In astronomy and astrophysics (hereafter, astronomy), large collaborative projects that employ expensive, cutting-edge instrumentation and are designed to tackle many research questions simultaneously are increasingly important. Career success may require that young researchers join these high-profile collaborations. By doing so, they gain access and visibility, meet future employers and collaborators, establish career-enhancing networks, and are enabled to build skills and confidence. WoC often lack the connections that are required to join these collaborations and be supported in them. 2. Difficulty achieving insider status: In astronomy, some activities in addition to writing research papers identify experts in their field and give younger researchers insider status and the full recognition that comes with it. These by-invitation-only activities include: serving on peer review panels and on telescope time allocation committees; refereeing journal articles; delivering invited talks at conferences, etc. Again, WoC often lack the connections necessary to receive these invitations. 3. Lack of effective mentoring: Effective mentoring, especially by thesis advisors, would be a key to overcoming barriers 1 and 2, but it is often lacking, sometimes because suitable role models are unavailable. Effective mentoring is more than giving academic advice and supervising thesis research; it involves these and other career-building activities. 4. Unfavorable department climate and lack of support: In the early years of graduate school, it can be crucial to know that at least some people in one’s department expect and hope for one’s success in astronomy. WoC in astronomy graduate programs encounter not only subtle signs that this is not the case but also even more damaging, overt indications, including: not being taken seriously in complaints of harassment or bias; inability to find department faculty to work with; and exclusion from department activities (e.g., meeting planning, departmental committees, social gatherings at professors’ houses). These barriers are especially challenging early in graduate school; WoC who manage to persist to the later stages of their programs develop coping strategies. 5. Cultural alienation: Cultural alienation often results in WoC never considering astronomy as a career, leaving the field before or after degree completion, and having to manifest one personality while in their department and another outside . 6. Hostility: Unfortunately, racism and sexism are still commonplace in STEM fields, including astronomy. In our experience, most WoC report having been subtly or overtly told that they owe whatever success they may have achieved to being women, minorities, or both, especially when WoC have achieved some milestone, such as landing a job or receiving an award. Such comments are clearly meant to diminish achievements and can be cumulatively devastating over time. 7. Accumulation of disadvantage and underestimation of performance: As WoC in their postdoctoral years seek junior faculty positions, the barriers that they have already faced are often not recognized. Thus, the performance “hit” they may have taken in overcoming these barriers is not taken into account. 8. Solo status/lack of critical mass in job searches: Since 1985, the percentage of astronomy Ph.D.’s awarded to all underrepresented minorities has been in the range 1% to 5% . If the gender balance of the field as a whole holds for WoC, then they receive fewer than 1% of all Ph.D.’s in the field. Research has shown  that a lack of like peers (women or minorities) leads to hiring disadvantages. Because of their small numbers in the field, WoC in Astronomy almost always suffer from solo status. All these barriers conspire to continue this situation. 9. Stereotype threat: WoC in astronomy are keenly aware that they are often the first, or nearly the first, WoC that colleagues and students have interacted with, sometimes in any STEM field. The pressure that WoC may feel as representatives of their gender and ethnic group, often called stereotype threat, can lead to stresses that manifest in poor self-esteem, underperformance, or ill health. More generally, WoC face the same barriers as other women in science: insufficient science education, lack of support, and socialized lack of interest in STEM; and, in the professional years, the two-body problem and problems of work-life balance. The above barriers inform our interrelated, but largely independent, recommendations to external communities for action items in support of WoC in academia. to provide supportive, interdisciplinary peer networks for WoC. Organizations like the Posse Foundation, Inc. and the Fisk-Vanderbilt Bridge Program  have valuable experience with this technique and should be seen as resources in establishing strong cohorts of WoC graduate students, in combination with HBCUs (historically black colleges and universities) and MSIs (minority serving institutions). For example, Florida International University (FIU) and Spelman College have successful undergraduate physics programs and can be expected to be able to extend their methods to the graduate level. Larger majority institutions should take the lead in providing the physical resources necessary to host these cohorts, and key participants should cooperate to build a framework for nurturing them. Lack of cultural awareness and understanding often leads to over-reliance on stereotypes. Requiring leaders in the academy, such as deans, department chairs, and search committee chairs, to participate in diversity training and awareness programs would force their attention to the issue. Funding agencies could make such training a requirement for federal research funding. In addition, professional societies could provide regular opportunities for such training at their conferences. An important resource is the University of Michigan ADVANCE Faculty Recruitment Guide . Key external participants: Funding agencies, leaders in the academy, experts in diversity, policy makers, professional societies. [7,8,9] have shown that only after reviewers are given specific metrics with which to assess candidates do they avoid giving unfair advantage to white males. The active dissemination of training materials (such as University of Michigan and University of Wisconsin materials) to departments and at society meetings will promote the adoption of fair hiring practices. Also, encouraging interaction between HBCUs/MSIs and majority institutions may highlight applicants often overlooked in hiring decisions. Reward departments or individual mentors for support of WoC. Departments, societies, advisors, etc. should be identified and rewarded for their support of WoC. Possible models are the “Woman Physicist of the Month”10 and the mentoring award of the AAAS. 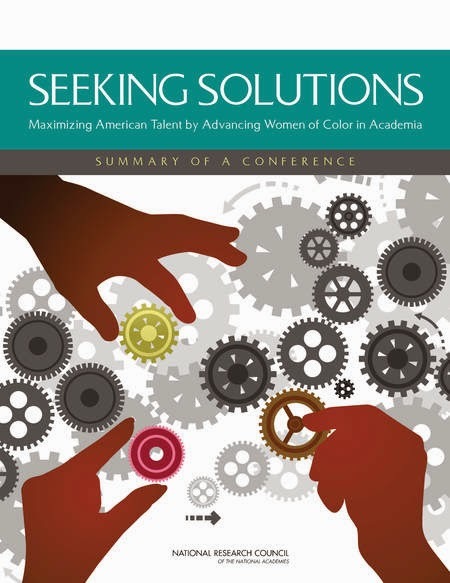 Maintain better statistics and connections to WoC through graduate school and early career. The small number of WoC pursuing astronomy, together with the lack of information about them, portends a dismal future for recruiting and retaining more. Creating a mechanism to engage and track WoC can provide significant insight into their obstacles and successes, which we can then begin to address. Once identified, these researchers can be invited to serve on review panels and similar bodies. at the professional level, as a part of, while distinct from, initiatives directed towards women or minorities in the field. This should include special networking opportunities at major conferences, digital venues for interaction between conferences, and funding to support regular meetings across the country for WoC. Professional societies, partnering with minority-focused, interdisciplinary societies, could lead this effort. Alternating these meetings between majority- and minority-serving institutions will allow communication and networking with all possible participants. Expand the Faculty and Student Teams (FaST) or Visiting Faculty Programs (VFP). WoC might get turned off by an initial group of people in a specific astronomy subculture, but might consider transitioning to another subculture (as opposed to out of the field completely) if they have the opportunity to engage a leader in another subfield. Funding for a researcher and 1–2 students to spend 2–3 summers with a leading expert can help. We hope that the AAS can be engaged in implementing the above steps. The following already existing initiatives are not specifically designed for WoC but are intended to lower barriers to an astronomy career. • The AAS vision statement and strategic plan include language supportive of underrepresented minorities. • The AAS has established committees on the status of women (1979) and of minorities (1997) in astronomy. Both committees have had WoC as active members and have often worked together to benefit underrepresented groups. – With assistance from the AAS, both committees maintain web sites, discussion boards, and list servers for their constituencies, and both publish bi-annual newsletters. – Members of these committees collaborated on preparing this testimony. • The AAS sponsors the Harlow Shapley Visiting Lectureship Program, in which professional astronomers discuss modern astronomy and astrophysics, mainly at colleges that do not offer an astronomy degree. This program is being redesigned with the aim of reaching out to underrepresented minorities. Although this testimony emphasizes the needs of WoC at the graduate and professional levels, we are impressed by the achievements of HBCUs and MSIs in improving their undergraduate science programs. For example, by creating inclusive learning communities, FIU grew its physics major from 10 to 150 students over ten years. Since 1971, Spelman College has increased the percentage of its students earning STEM degrees from 9% to 30%.11 Key factors in its success include: a strong institutional vision combined with cooperation between faculty and administrators; external funding; and strategic partnerships with research institutions, national labs, and private STEM companies. The recommendations in this testimony are consistent with this philosophy.